Dell India stylish and elegant 21.5" Full HD monitor is designed to shine with ultra thin bezels and built in speakers. You can see list of our Dell S2218H FHD vs Dell S2216H FHD below, perform Side-by-Side comparison. If you need further help, do have a look at Conzumr Guides and Tips. Alternatively you can view all Monitor to choose your own favourites. Elegant and stylish 54.6cm (21.5) monitor with ultrathin bezels and built-in speakers. 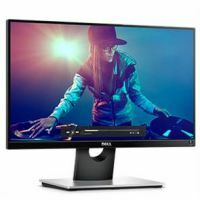 With the expanded viewing area provided by an improved ultra thin bezel, the Dell 22 Monitor offers a sleek, premium look and exceptional home entertainment experience. Engaging video and audio experience: Maximize your entertainment experience with rich and vibrant colors across wide viewing angles in Full HD resolution, a sleek screen, and dual 3 W integrated speakers. 21.5 " S2218H : 21.5 "
21.5 " S2216H : 21.5 "
3-year Limited Hardware Warranty. S2218H : 3-year Limited Hardware Warranty. To Recieve updates and possible rewards for Dell S2216H please sign in. To Recieve updates and possible rewards for Monitor please sign in.